The Via Dolorosa, also known as the Way of the Cross, commemorates the path which Jesus walked while bearing the cross, from the place of judgment (Praetorium) to Calvary. 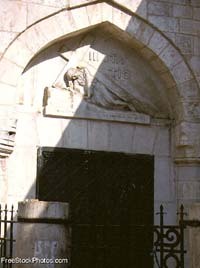 It starts at the Church of Flagellation, winds through the streets of Jerusalem into the Christian Quarter, and ends in the Church of the Holy Sepulcher. There are 14 stations along the route, and each one marks an event that took place during Christ's last walk before his crucifixion.